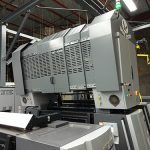 Eagle Systems is one of the pioneering manufacturers of Cold Foil Systems, and its’ Eco-Eagle Cold Foil System offers a unique in-line foiling solution for any offset printing press. The Eco-Eagle Cold Foil system is a value-added finishing technique for cold foil applications and the add-on system can retrofit onto any new or existing sheet-fed offset press. The Eco-Eagle System from AeTee provides the benefits of high-quality performance and reliability, as well as efficient machine-ability and cost effectiveness. Spot or overall foil coverage is printed inline and then overprinted at standard press speeds. One key advantage the system offers is the ability to use webs of foil in single or multiple widths, as narrow as 2 inches, and in any combination, which greatly reduces foil cost and consumption, and eliminates waste. Set up times of less than 10 minutes and complete automation ensures the system delivers significant cost savings.